This is version 1.1 of the GIS data. The data have been reorganized into more manageable file sizes. Please print the readme.txt file for detailed instructions on downloading and installing the files. These files constitute a GIS database of industrial and metallic mineral resource assessment tracts, and is an accompaniment to the non-fuel mineral resource assessment of Afghanistan. Also included are geologic, structural, geochemical, geophysical, environmental, political, and other geospatial datasets covering Afghanistan. The purpose of this GIS database is to provide a collection of basic geoscientific datasets to support the assessment of mineral resources, their further exploration and development, and to provide a partial index of known data resources. About 10 gigabytes of free hard drive space will be required for download and installation of the self-extracting archive files that make up the GIS database. The U.S. Geological Survey (USGS) cooperated with the Afghanistan Geological Survey (AGS) of the Afghanistan Ministry of Mines to assess the undiscovered non-fuel mineral resources of Afghanistan between 2006 and 2007. This report presents the results of this work and contains chapters describing and assessing the mineral resources of Afghanistan. An accompanying Geographical Information System (GIS) is an accompanying disk that includes supporting data. Funding for this effort was provided by the United States Agency for International Development (USAID). For more information please contact the author. 5.2.1 Description of tracts for pluton-related gold deposits. 12.1.1 Description of emerald veins model. 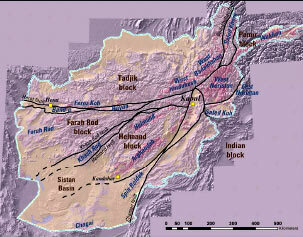 Appendix 1 Geographic Information System (GIS) Project to Accompany the Non-Fuel Mineral Resource Assessment of Afghanistan.